"A simple yet action packed game." Don’t Be a Fried is a simple little action game where you play as a very small Octopus who has rather dangerously found himself on the four burner stove on top of a cooker, and if that wasn’t dangerous enough, cutlery is flying hard and fast in his direction so you will have to use a combination of skill and speed to avoid all the obstacles coming in your direction, at certain points the stove burners will turn on with fish on them, which you can eat if you are fast enough for a bit of a boost to your health bar, but stay on the burner too long and you will lose health if not die in the game. 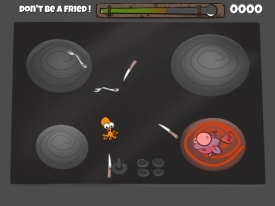 Don’t Be a Fried is a silly game although admittedly fun it is not a game you can look for any kind of deep meaning within and does feel as if it may have been better suited to be a flash browser game but if you’re looking for some simple mindless and easy to pick up fun then you can’t really go wrong here. 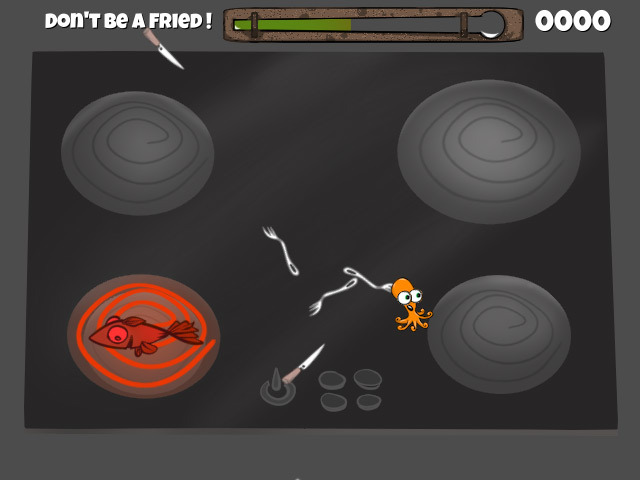 You can download Don’t Be a Fried here for free.